Sam Kerr celebrates the Matildas’ second goal late on. 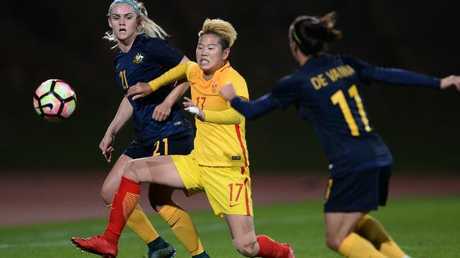 THE Matildas claimed a deserved 2-0 win over China but the scoreline fell short of delivering an Algarve Cup final appearance. 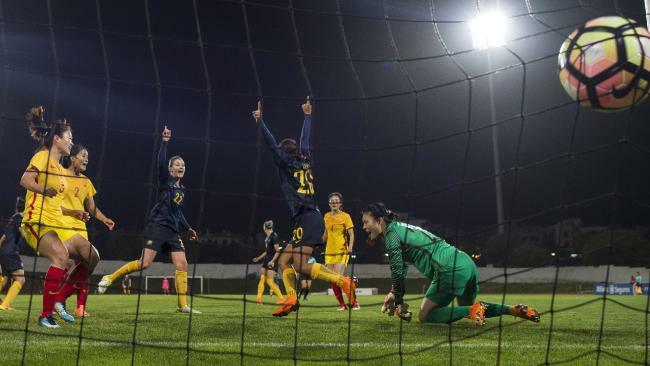 In the end, Chloe Logarzo and Sam Kerr found the net to hand Alen Stajcic's side a likely third-place play-off against host nation Portugal on Thursday. Despite scoring eight goals against China over November's two friendlies, the world No.4 Matildas couldn't deliver the four required to make the final of the invitational tournament, key preparation for next month's World Cup qualifiers. The Matildas had a tough time containing China’s attack. One opened up in the 30th minute when goalkeeper Wang Fei fumbled Elise Kellond- Knight's free kick.